My first experiments in Digital Art. 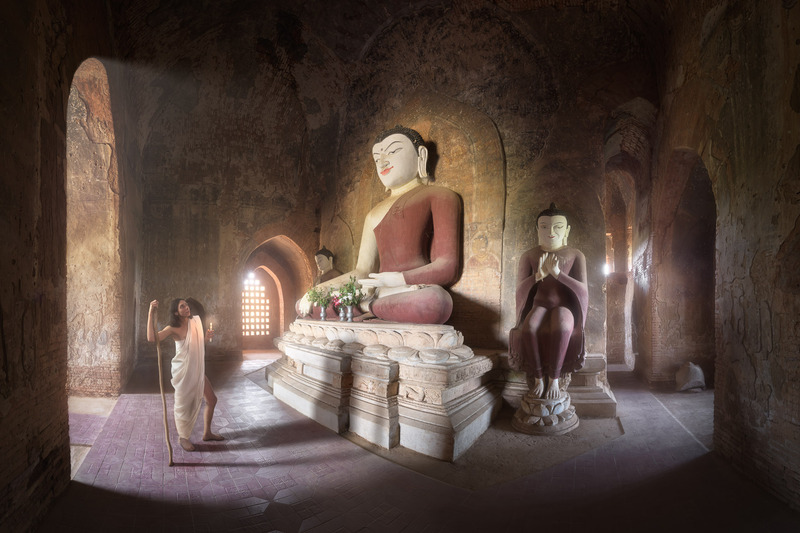 This is composite image created from 2 different photos I made in different places – one in Bagan, Myanmar and other in my home studio in Moscow. Why? To tell the story I will never be able to photograph in reality. What if our most deeply held beliefs only tell us part of the story? To people of faith, religion is sacred, its teachings passed from one generation to the next. Religious teachings provide us with a moral compass for our life here on earth and offer comfort in times of doubt and distress. Composite image, background – panorama from 5 vertical shots, focal length 14 mm, aperture f/11, shutter speed 4 seconds, ISO 64, tripod, foreground – studio shot. But our faiths are ancient and scriptures have been lost over the centuries, their teachings destined to be unknown. How can we be certain that what we know of our faith — Christianity, for example — is all there is to be known? What if there are other stories that have never been told? What if the life of Jesus is only partially known? There are scholars who believe there is still much we do not know about the life of Jesus Christ. The New Testament is strangely silent on part of his life, the years from childhood or early adolescence until he began his ministry at roughly age thirty. As Jesus only lived to be thirty-three, it’s a span of time that encompasses most of his life. The missing years, as they are sometimes known, have intrigued historians and theologians for years. There are those who believe that the young Jesus — before he began his ministry — might have traveled to India, where he was exposed to Buddhism and influenced by Buddhist monks. Some of you may raise an eyebrow at that possibility, but stay with me. We know there are similarities between Christianity and Buddhism. They both teach kindness and compassion and encourage lives of prayer and contemplation. Does it diminish the life of Jesus in any way to consider that he might have been influenced Buddhism? I don’t think so. I think the idea that one of the world’s greatest religions and one of its greatest philosophies were shaped by each other is a fascinating possibility — and maybe only that. For this photograph, I tried to imagine the young Jesus encountering the Buddhist Temple in India for the first time. I imagined a young man, thoughtful and profoundly spiritual, slowly entering a temple, his eyes full of wonder and his mind full of questions. Did it happen? I don’t know. But I’m intrigued by the possibility. This entry was posted in Digital Art and tagged Experimental.